By Louisa Mitchell for Civic Exchange and The Women’s Foundation. Published in Hong Kong in February 2013. A detailed profile of the socio-economic conditions confronting women in Hong Kong today, as well as the context for how this has changed over the last twenty years. It comprises secondary analysis of publicly available census and by-census data for 5 key age bands (≥60years, 40-59 years, 30-39 years, 20-29 years, teenagers/girls ) and a literature review of academic research as well as ‘grey literature’. This study was developed in conjunction with another Civic Exchange research project which uses Hong Kong Transition Project data by gender to provide new analysis on women’s demographics and attitudes over the last two decades. 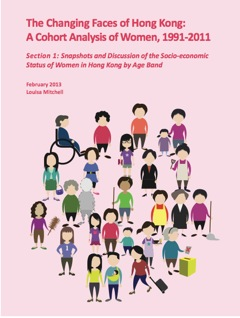 This report was also published in February 2013 and is called The Changing Faces of Hong Kong: Women in the Community and National Context, 1994-2010. A graphical summary of both reports was published by Civic Exchange at the same time. It is entitled The Changing Faces of Hong Kong: A graphical summary of women’s status, 1991-2011.